Update 7/12: Below is a land owner map of the area, courtesy of Bruce Morlan and his Politics and a Pint blog post. 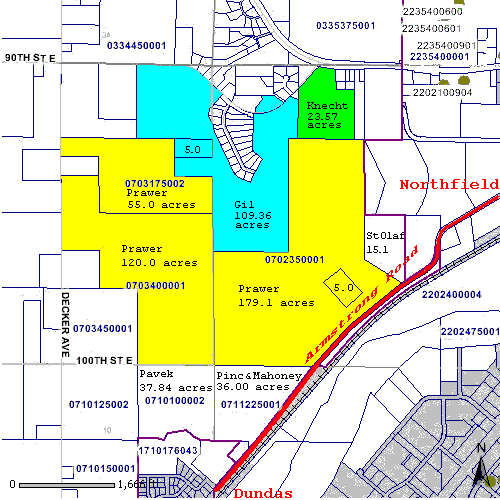 July 8 Nfld News, New annexation request may extend Northfield westward. … on July 1, 2009, Mr. Robert Gill and Mr. Kenneth Prawer submitted formal annexation requests to the City of Northfield. The City Council is expected to give City staff directions on how this request should be addressed at its July 20, 2009, City Council meeting. The proposed annexation consists of 456 acres and, if annexed, would most likely be developed as business and light industrial. The Bridgewater Township Board has been notified by the applicants that they have submitted applications to the City of Northfield. The City of Northfield currently has a signed annexation agreement with Bridgewater Township to allow up to 150 acres in a five-year period with no more than 60 acres in one year. Some of the proposed annexation area is not included in the annexation agreement. Therefore, as a result of these conditions, the annexation agreement would need to be amended to enable these annexations to be completed. The Council can request that the Planning Commission hold a public hearing on the annexation requests, and then make a recommendation to the Council. The Council can decide not to pursue the annexation requests. If so, the application forms and fees would be returned to the applicants. The Council can delay the consideration of the annexation requests until a market study can be completed for the Northfield area. Bruce…I’m with you. At what point do we ask “what is enough” and for what purpose? I often think the major benefactors of expanded growth in a city is the city government itself. If we don’t expand our tax base, then the city will have only one choice—increase taxes on those of us who remain here. If they do that, then we all will become quite familiar with the growth of government. So, the way to make that a bit harder to discover is for the city to grow in tax base. Then government can grow and no one is the wiser! We are now seeing some interesting twists to that idea, now that most property is falling in value. The direct result is an increase in real estate taxes while the value of your property is falling….an entirely new event for most people. So, is growth good…is growth necessary….??? David, I fully understand that the land around me is only protected to the extent that existing agreements, zoning laws, cuilding regulations, etc allow. It’s no different than if I were to live in town and have the zoning changed on the house next door so that they could build a manufacturing plant. I realize that’s an extreme comparison but it takes me back to my original argument. I’m not foolish enough to think that change doesn’t happen and growth can be stunted. You won’t find me anywhere near the anti-growth crowd as I fully support smart, well thought out and planned growth. That’s not what this is. I understand the landowners are instigating this as is their right. What irks me and those around me is the potential for a city led land-grab mentality without so much as a basic plan in place. 1. No plan leaves our neighborhood in limbo regarding future home values, neighborhood viability, and home sellability. 2. No plan means no legit discussion on how this will affect the watersheds in the middle of this. 3. No plan means no direction, no direction means Faribault-style commercial development(It’s everywhere you look). 4. No plan means no road-impact considerations. 5. No plan means my family and others in our neighborhood are trapped. Would you buy a house in a neighborhood about to be surrounded on three sides by a “yet-to-be-planned” but zoned industrial park? Even if we wanted to sell to relocate into a non-industrial area…we will not be able to. At least with a plan, there can be a discussion as to how it should be executed so as to limit the impact on those of us in it’s path. The current agreement between Bridgewater and Northfield allows us 10years to do so. It may surprise you to find out that’s WHY the “anti-growth” crowd is the ‘anti-growth crowd’ ! Think it through to the best plan that supports the best principles, and serves the most need , and you have smart growth. You are raising all the questions that are always raised as poor planning and faulty thinking, so right now you ARE in the anti-growth crowd. Kevin and Kiffi: Bruce and Ray bring up some interesting points about “smart growth”. Their responses go more toward smart government growth of public needs. Ray has had first hand experience with this problem in the Legislature. We need a decision rubric for public spending decisions. How do we decide if we need a $12 million, $3 million or $0.0 million expenditure for the Safety Center? What is the smartest growth? David: the smartest growth for the safety center is that solution which adequately satisfies the space needs for the firemen, re-uses the existing building, and by doing both those things without overburdening the finances of the city or the taxpayers. And I think that would begin by acknowledging the “minority report” rather than opposing it. Yes, that irks me too, Kevin. As you recall, the Northfield City Council voted on July 20 to move ahead with the annexation process as described by staff and, in a separate resolution, voted to waive the requirement for a concept plan. Any hope I had that the township would receive due process in the handling of this matter ended that night. Mayor Rossing picked up on the theme at the property walk on the trout stream the following week. When I brought up the fact that, according to the concept plan map, development would begin on the north side of the creek, I was told that was mere speculation and there was NO PLAN. So, the approach has changed. Yes, a consulting firm has been hired to do a “master plan” for both industrial parks. But that comes later. We need not expect environmental review either. According to the DOA planning office, an EAW may be required when a specific project comes forward. It seems that Larry Larson of Land Vista LLC will be scouting for projects for both industrial parks. I have been surprised at the Northfield Energy TF people who, instead of promoting green industries for the Greenvale Industrial Park, are anticipating federal money to develop the more sensitive Bridgewater site. How disillusioning. Fortunately, a stream protection ordinance for Spring Brook was required by the terms of the annexationi agreement and work on that is underway. Northfield won’t be able to drop the ball this time, like they did ten years ago. The jig is up. Just a note of the addition of several relevant documents to the Bridgewater site. Supervisor Kathleen Doran-Norton has set up a Water page, primarily pertaining to Spring Brook/Rice Creek. The most critical document is the 1999 Spring Brook Committee Report. The Economic Development Director has been gathering information for Hoisington Koegler consultants as they prepare to begin the master planning of the proposed business park. The Economic Development Authority Board will have a joint meeting with the Master Plan Steering Committee on Thursday, September 24. The purpose of the meeting is to establish the expectations of the EDA Board and Steering Committee as the master planning process proceeds. Griff : The reason you can’t find it on the city’s web page may be that it was NOT a public process, The ‘steering committee’ has been described as something requested by the consultant, and it is made up of what some might refer to as “the usual suspects”. The entire EDA is not on it, although they are tasked with being the lead agency on the business park development. Questions you might ask are: 1. Who selected the committee members? 2. Was the entire EDA privy to, and had input to, the selection process? 3. What was the consultant’s reason for wanting a committee of this nature as opposed to the EDA? 4. What will be the impact of this committee as opposed to the EDA? 5. Will this committee be a voting body, and if so how will that impact the EDA process? 6. If this is a ‘community opinion/input’ process desired by the consultant, why was it not open to application? Well, here’s one really good outcome ( there were more) from the steering committee meeting last night: Mark Koegler, owner of the HKgi consulting firm doing the Master Plan for the annexation, announced that all the meetings of the steering committee would be open to the public. That does not mean public input sessions, as they will be work sessions for the committee, but the public is welcome to attend and listen. That is a different perspective from the EDA leadership which had said, as late as yesterday in their meeting packet, that this first meeting would be public, but not successive meetings. There will also be at least two public input meetings along the way; my personal POV is that Mr. Koegler, having worked on a previous Master Park Plan, and a previous Comp Plan (maybe more that I am not aware of), is well aware of Northfield’s ‘personality’ and engaged citizenry, and has not only the confidence, but the expertise to provide for a good amount of public input. Members of Northfield Planning Commission were surprised to learn at their meeting Tuesday night that they will hold a public hearing on the proposed Gill/Prawer annexation on Tuesday, Nov. 24. They requested materials for study ASAP. That’s about ten days away and looks calculated to be sure of low attendance. Please spread the word and look for a public notice in NNews. St. Olaf break officially starts Nov. 25, but many leave the day before. Stephanie: It is my impression that since the Planning Commission is the responsible entity to hold the Public Hearing, not the Council, they can schedule it to suit their comfort level (as far as time to go over their study materials for same). Now that would be considered a big revolt, but I think it would be correct for them to do so, after all the Public Hearing is theirs to conduct and they should feel in command of the pertinent materials. After all the extreme discontent with the Land Development Code, I think they’re in a ‘testy’ mood anyway, they’ve been having extra meetings for months. Just a heads up: the first meeting of the Consultant Group Steering Committee and the EDA, on the “Northwest Territories” annexation (530 Ac. in Greenvale) is from 6-8 PM tonight, Council Chambers. Kiffy, the Planning Commission certainly did not set the date of this hearing to suit their comfort level. The date was dumped on them at their meeting of Nov. 10. SEQUENCE: A NNews reporter told me on about Nov. 5 that there was a public hearing on Gill/Prawer set for Nov. 24. I checked with some Planning Commission members who knew nothing of this and did not believe such a date had been set. I then asked Joel Walinski about this after our stream protection meeting at St. Olaf on Friday, Nov. 6. He checked his calendar and confirmed the date. Dan Olson confirmed the date when members of the Planning Commission asked him about it at their meeting Nov. 10. The Planning Commission had no materials to go on at that time. If they had been able to move it to a later date they really should have, given the problem of timing it for 2 days before Thanksgiving. There was one public notice (last Saturday paper) and evidently staff thinks they have handled it correctly. See you the night of Nov. 24, I hope. Posted to the Nfld News today at 5 pm: EDA backs annexation proposal. The recommendation, which passed 4-2 at the EDA’s regular meeting, will be sent to the council for consideration. Board member Victor Summa and EDA Vice President Steve Engler both voted against the measure, saying that the board did not have adequate time to review the information presented to the board by city staff and ask questions. “I wasn’t voting against the proposal, I was voting against the process,” Engler said after the meeting. Sat. 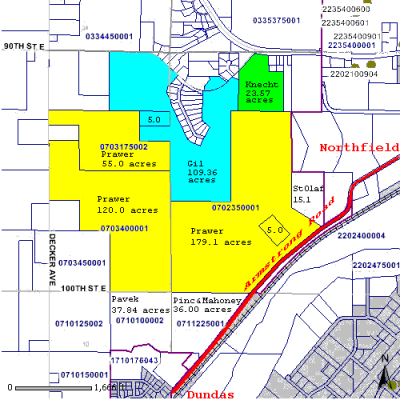 Nfld News: Weighing the options on a second annexation. At its meeting on Sept. 14, the Northfield City Council asked three of its boards and commissions to weigh in on the proposed annexation of 456 acres of land in Bridgewater Township owned by Kenneth Prawer and Robert Gill. This week, the city got its answers — from a few expected sources, and at least one unexpected one. The information the boards returned to the council will be reviewed at the Planning Commission’s meeting Tuesday. Reminder: the Northfield Planning Commission is hosting a public hearing on Tuesday, 7 pm at City Hall re: the Gill-Prawer annexation request. Agenda and packet here. The EDA’s letter endorsing the annexation is on page 47 of the packet you linked. The Park and Recreation Advisory Board letter is on pages 48-49. The Environmental Quality Commission recommendations are on pages 50-52. Unfortunately, the unsolicited ‘Rice Creek (Spring Brook) Concerned Citizens Group’ report is not included in this PDF. The citizens group authors include Paul Jackson, chair of the Environmental Studies Department at St. Olaf College. Any chance of finding this report posted online for our perusal? An e-mail circulating is asking people to look at an article in today’s (11.23.09) Winona Post newspaper. The article is entitled: City Wants Closed Door Meetings with Wilson Twp. Officials”. The relevance here is that the attny for the city who is requesting a closed door meeting is Chris Hood, the newly selected candidate for NF City Attorney. An attorney must work for their client; that is their obligation; the question here is should that obligation go against recognized state law? That 12/26/2004 article is here: City wants closed-door meeting with Wilson Township officials. So, what happened at the Planning Commission-hosted Public Hearing last night? Council Chamber packed to overflowing. Tracy did a GREAT job of handling Public Hearing; humane, which is what a PH should be. Very informed and eloquent comments from many people. Planning Commission seems to be tasked with only replying as to whether annexation synchs with Comp Plan; this …IMO… a new tactic being employed ostensibly to facilitate decision making (i.e. last weeks council decision process/packet layout on Safety Center) but in fact putting THE BIG PICTURE somewhat outside the relevant comment area requested. Here’s the question: Can the Planning Commission, a very principled and thoughtful group, comment on the annexation in a qualified manner which says their approval is based on the uses the land is eminently suited for and eventually put to over the next 10-50 years, and even beyond? See NNews report of the hearing (p.3 of Wednesday paper). All three of my supervisors spoke. I was pleased that the Stream Protection report is available to the Planning Commission, however it is only a set of recommendations upon which to base an ordinance. Many thanks to Suzie Nakasian for pressing Brian O’Connell about having an actual ordinance drawn up. He does not want the delay, obviously. The committee that chose Flaherty & Hood over Maren Swanson really knew what they were doing. This firm has been doing work on annexation for Northfield for a couple years at least. They posed the language for a bill carried by Sen. Bakk to put townships at even more of a disadvantage. We fought that bill all last session. The Winona Post report Griff provided gives just one example of Chris Hood’s work. I suppose this firm begins working for the City of Northfield Jan. 1. Here’s the Nfld News article on the hearing: 50 attend hearing on Bridgewater annexation proposal. The Northfield Planning Commission got an earful Tuesday night from farmers, fishermen, scientists and businessmen, all of whom were concerned about one thing: the potential annexation of land in Bridgewater Township. But despite a number of wide-ranging worries, some speakers at the commission’s packed public hearing over the proposed, 456-acre annexation west of the city expressed a little optimism about the project — if it is done right. Valuable information was presented at the hearing Nov. 24, but I have to say I was disappointed that groups like LWV and CRWP, calling for things to be “done right” but declaring themselves neither for nor against the annexation, seemed to set the tone for the evening. Individuals following them to the microphone with many questions and complaints, but did not go so far as to say they were opposed. And so, we have Chair Tracy Davis on KYMN Saturday morning, saying that people had concerns but only one speaker was “flat out” opposed. I guess that was me. To be clear, I accept annexation as a fact of life. The township and the City signed an agreement in 1999 which set the terms for annexations for the next 20 years. As Supervisor Kathleen Doran Norton said in her statement at the hearing, Sec. V says the City will not request annexation except under terms of this agreement. This annexation is in violation of our agreement and I oppose it. Stephanie raises a very strong question here… How will section V of the annexation agreement be addressed? The flat out statement that has been made is that the agreement will have to be re-negotiated. So what should the process be? Should the annexation be put on hold by the City/NF, until they have discussion with the Bridgewater supervisors? Should the B’water supervisors have to poll their constitutents before they come to a conclusion with Northfield? If B’water, et al, does not wish to acquiesce, should NF deny the request? Hoisington Koegler, the planning consultants that have been hired by the city to master plan the 530 Acres (and additionally the Prawer-Gill properties if that annexation goes ahead) is holding a design charette today and tomorrow , at the South main building of the Community Resource Bank, and THERE IS A PUBLIC COMPONENT OF THE PROCESS FROM 4-6 PM EACH DAY. The public portion is a “pin-up session” to gather input or reaction to the initial planning ideas. There was virtually no promotion of the public part of this charette process although the consulting firm was clear about their intent for that to occur, and at this late time it is hoped that enough people will find out about it and become involved to benefit the process. The Planning Commission’s recommendation to the City Council on the annexation request from Bridgewater property owners is on the agenda for the 2/9 City Council meeting. I blogged the PC’s recommendation here. .-= (Tracy Davis is a blogger. See a recent post titled Recommendation on Bridgewater annexation request) =-. If the council wanted to facilitate the process of annexation discussion with Bridgewater, the city could work on the relevant part of the stream protection ordinance first, get that part out of the way, and reassure the Bridgewater people that the creeks will be protected. (assuming that the ordinance is stringent enough). That would be a ‘good faith’ action that might satisfy at least one part of this process. Then, of course, there is the issue of the fact that part of this annexation area is not within the boundaries of the current annexation agreement. Yes, Kiffi, you are right on both points. I posted a comment on Tracy’s blog yesterday, that I will summarize here. I was disappointed at the 5-1 Planning Commission vote recommending the annexation on Jan. 7. If Ron Griffith and Ross Currier had been on the Commission, I dare say things would have turned out differently. And, if the violation of open meeting law had come to light earlier, more PC members might have been hesitant to rubber stamp the staff recommendation. The Council vote Feb. 9 was just as disappointing. Buckheit did object to the materials in the packet as more propaganda than fact, but then voted to give preliminary approval anyway. Jon Denison made the motion and Rhonda Pownell seconded it, as has become the routine. At last night’s council meeting , item#9 on the regular agenda was a motion to “Approve Annexation Policy Positions”. This was a fascinating discussion for any small town politicos or policy wonks. The council’s new City Attorney, Chris Hood, began by saying that there are lots of contingencies or specific circumstances (re: annexations), and that there was a need to reserve discretion to remain flexible. He then said he did not see a need for a ‘policy’, and recommended that each annexation be looked at with specificity. Councilor Denison asked for comparisons with other cities; Mr, Hood replied that TYPICALLY such policies are NOT seen in other cities, and that maybe those other cities were not as “process oriented ” as NF; the desire for a policy maybe being an outgrowth of that “process oriented” characteristic, but reiterated again, no, typically NOT seen. Councilor Buckheit could see a value as to establishing a baseline for policy decisions, recognizing the guidance of the Comp. Plan. Councilor Zweifel felt a matrix format would be more useful as an evaluation tool. Mayor Rossing emphasized that it was good to have a policy document that expressed the COUNCIL’S policy( i.e. speaking in a unified voice). Councilor Pokorney made a good point that the current issues of Waterford and Bridgewater should not be a part of this document; it should be “general”. He wanted to be sure this was not seen as “staff driven”, saying “we (council) spent over an hour ( i think he meant at their work session) discussing this subject”. Attny Hood reminded all that in the end, annexation is largely guided by MN statutes, and the vote was unanimous to pursue a policy document. Tuesday April 13, is the long-awaited Northfield Council work session with Waterford Township, I believe. That should be interesting. Second Tuesday would ordinarily be a conflict w/Bridgewater Township monthly meeting. However, Clerk Janalee Cooper reminds me that Bridgewater has changed its monthly meeting to second Wednesday. All in all, it will be a busy week.